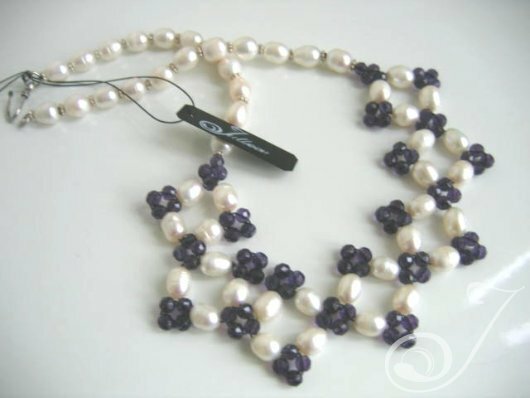 Bridal Necklace Weave Design Like Lace Using Purple Facetted 5mm Amethysts and Genuine White Oval Pearls On Sterling Silver Spacers and Clasp. Great for the purple theme wedding – 17″. Here it is on lovely Jacleen with that gorgeous porcelain complexion. Pearls look fabulous on pale skin. But sometimes only white pearls may not be as flattering, as something with added colour. In this case the addition of dark purple amethysts compliments her complexion. Jacleen always looks sensational in purple and choosing this jewellery was so clever. See how the middle section of the laced pattern which has been woven with white oval pearls and dark facetted amethysts, sits beautifully on the bodice? We adore this Design at My Bridal Jewellery it is one of our very favourite pieces that looks good on everyone. We make it in just about any colour you could wish for. You just need to ask us.